Nintendo showed off its next-generation Wii U console at the E3 Expo in Las Angeles. Coming in 2012, this new console will finally deliver 1080p HD graphics thanks to a new 45nm custom chip from IBM with lots of embedded DRAM and a yet unknown graphics processor. 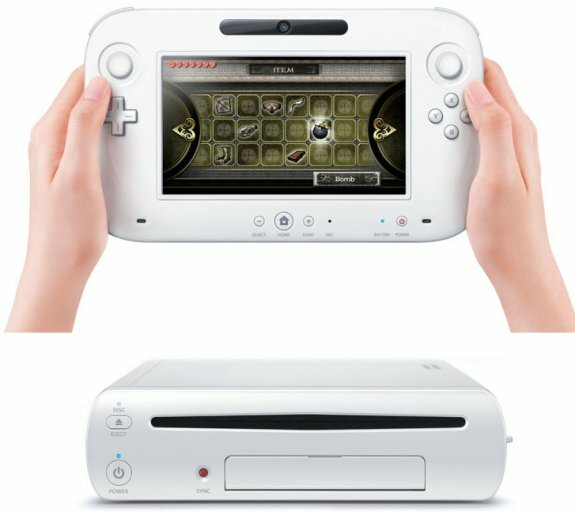 The Wii's successor is expected to rival the PlayStation 3 and Xbox 360 in terms of performance, and reportedly features integrated flash memory (capacity still unknown), a disc reader, a SD memory card reader and four USB 2.0 ports. The Wii U will be compatible with all current-gen accessories and software, there's support for the Wii Remote but the preferred controller will be a new controller with a 6.2" touchscreen! This tablet-like controller features a front-facing camera, a gyroscope, accelerometer, dual-analog controllers, two shoulder buttons, two triggers, and a microphone. Interestingly, the Wii U's controller can be used to game and video chat even without a TV screen, but Nintendo stresses that it can't be used as an independent portable gaming machine. More info in the press release below. "Wii U redefines the structure of home entertainment by fundamentally changing how the TV, the game console and the Internet function and interact together"
The new controller can display information on its screen that does not appear on the TV. The information and viewpoint can also change in the new controller based on the orientation of its gyroscope. Nintendo 3DS: Super Mario™, Luigi's Mansion™ 2, Mario Kart™, Kid Icarus™: Uprising, The Legend of Zelda™: Ocarina of Time™ 3D, Star Fox 64™ 3D, Animal Crossing™, Paper Mario™, Picture Lives!, The Rolling Western™.